Shuffle the train cards and deal 4 cards to each player. The remaining deck of train car cards are placed next to the board and the top five cards from the deck are placed face-up. The Longest Path Bonus card is also placed face up next to the board. Now, someone shuffles the Destination Ticket cards and deals 3 cards to each player. Each player decides which ones they wish to keep. A player must keep at least two Destination Ticket cards, but may keep all three if he wants. The returned cards are placed on the bottom of the Destination Ticket deck which is also next to the board. 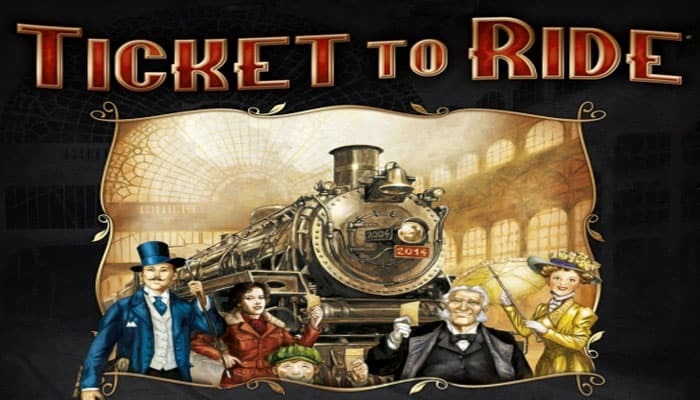 All players must keep their Destination Tickets secret until the end of the game. completing a continuous path of routes between two cities listed on your Destination Tickets. Note: Points are lost if you don't complete the route given on the Destination Tickets you kept. Choose a player who starts first (often the most experienced player). The play proceeds clockwise until the game ends. The player can perform only one of those actions. 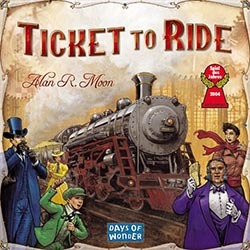 The player can draw two Train Car cards. He may choose between the face-up cards or he draws the top card from the deck. If he takes a face-up card, he must turn a replacement card face-up from the deck. Then the player draws his second card, either from the face up cards or from the top of the deck. But when he picks a locomotive card from the face up cards, he can't. It's allowed to have any number of cards in your hand at any time. There are 8 types of regular Train Car cards, plus Locomotive cars and their colors match various routes between cities on the board. Locomotives are multi-colored and act as a wild card that can be part of any set of cards. If a replacement card is a locomotive, the player can't take it immediately. If at any time, 3 of the 5 face-up cards are Locomotives, all 5 cards are immediately discarded and 5 new ones are turned face-up to replace them. When the deck is exhausted, the discards are reshuffeld good and become a new draw pile deck. When the deck gets empty and no discards are available, the player can't draw another Train car card anymore. Instead he may only claim a rout or draw Destination Ticket cards. A player must play a set of cards equal to the number of spaces in that route to be able to claim it. The set of cards must be of the same specific type. 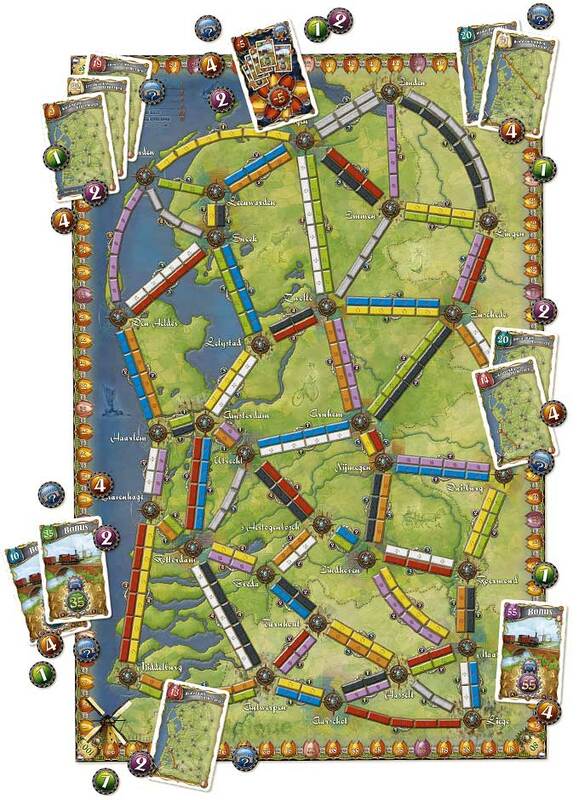 When a route is claimed, the player can place one of his plastic trains on each of the spaces of the route and all cards used to claim the route are discarded. A player can claim any open route on the board and they don't need to connect to any of his previously played routes. 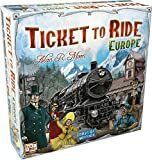 Player can claim maximum one route on his turn. When cities are connect by double-routes, then the player can't claim both routes to the same cities. Note: In 2-3 player games, only one of the double-routes can be used. The other route will be closed to other players once one route has been claimed. A player can draw more Destination Ticket cards if he wants by drawing 3 new cards from the top of the Destination Ticket Deck. He keep at least one of the cards, but may also keep 2 or all 3. The returned cards are placed on the bottom of the Destination Ticket Deck. 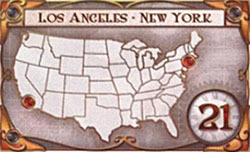 Each Destination Ticket includes the name of two cities on the map and a point Value and when the player can completes a connection between these two cities, he will score those points at the end of the game. If the player fails to connect the cities, then the indicated amount of points will be deducted. Destination Tickets are kept secret and a player may have as much cards as he wants. 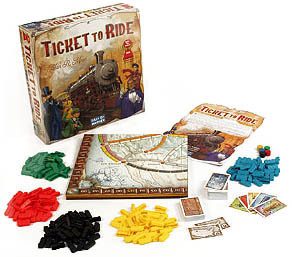 When a player's stock of colored plastic trains gets down to 2 or less trains at the end of his turn, the final turn will start. After that turn, the game will end and players must calculate their final scores. 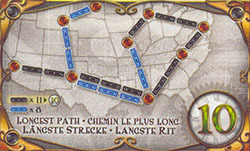 The points earned of completed routes are already accounted during the game. Then players reveal all their Destination Tickets and add or substract the indicated values. The player with the longest continues path of routes receives this special bonus card and can add 10 points to his score (in case of a tie, both players receive the points). The continious path may include loops and pass through the same city several times, but a given plastic train may never be used twice.